Kobold, represented locally by Instrotech, has on offer their type TNS and TNF series for direct measurement of analogue temperature in industrial processes. The heat-dependent pressure is transferred mechanically at one end of a nitrogen-filled pressure line to a pointer element. A stainless steel immersion shaft protrudes into the medium at the other end. For applications with strong vibrations, the gauge measuring system may be dampened with glycerine or oil. The TNS is a stem thermometer according to DIN 16205. The TNF series comprises of capillary thermometers according to DIN 16206. Up to 100 m capillary between probe and housing enables a remote and reliable temperature monitoring. A variety of typical industrial connections and options allow mounting the instrument exactly as per specified requirement. 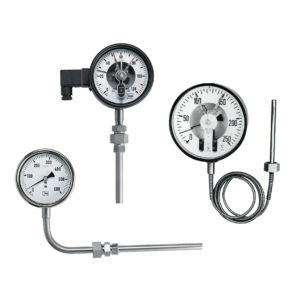 The 16 standard measuring ranges range from -40 to 600 °C. Special measuring ranges are also available. The protection degree is IP65. Designs with one or two contacts enable a reliable monitoring of limit values, and slow-action contacts, magnetic spring contacts or inductive contacts are available to choose from. The post Industrial analogue temperature measurement appeared first on EE Publishers.